We have one of your castles for my little boys 5th birthday at the weekend I would like to thank you for such an amazing service my little boys face was priceless at the castle. 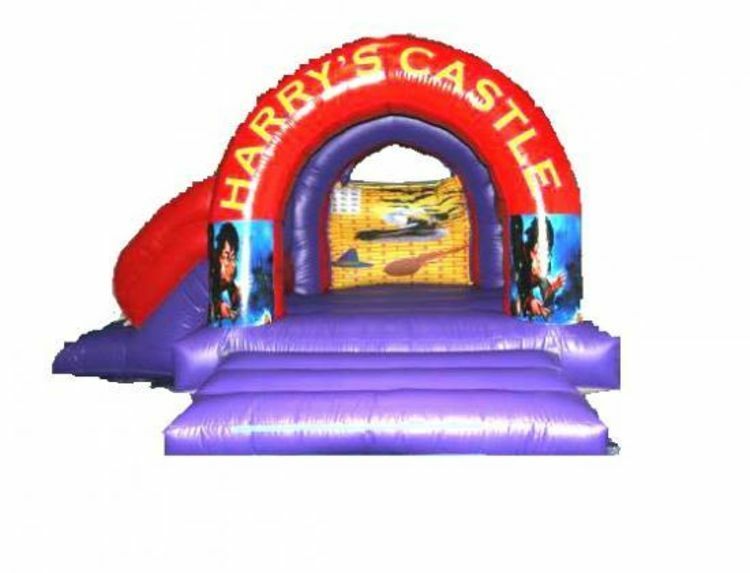 harry potter slide bouncy castle hire widnes. Our 15ft x 17ft harry potter slide themed bouncy castle is one of are new castles to are fleet.And is based on all the harry potter films and is very popular with boys and girls.it has amazing artwork of all the films stars on the walls and arch of the castle.Also there is a slide on the castle for the kids to have more fun.So book it early to make sure you dont miss out on you party.And you can do it on line so book it now.This themed bouncy castle has a raincover so whatever the weather you can still have fun on The harry potter slide themed bouncy castle.The required space you will need is 15ft x 17ft,the height of this bouncy castle is 11ft.If the bouncy castle is going indoors,please ensure the celing height of the venue where the bouncy castles going is higher than the bouncy castle.We deliver our themed bouncy castles, inflatable slides,rodeo bull hire,plus are assault courses and adult bouncy castles and domes,to Merseyside & Liverpool, Widnes, Runcorn, Wirral,Warrington, and St Helens, and some of these areas and further areas will be a additional fuel charge or toll/tunnel charge.Check our delivery checker on our home page,it will tell you if there is a charge for your area.